Ambiente, the world largest trade fair for the consumer goods industry is where the latest trends in design are launched to the public. 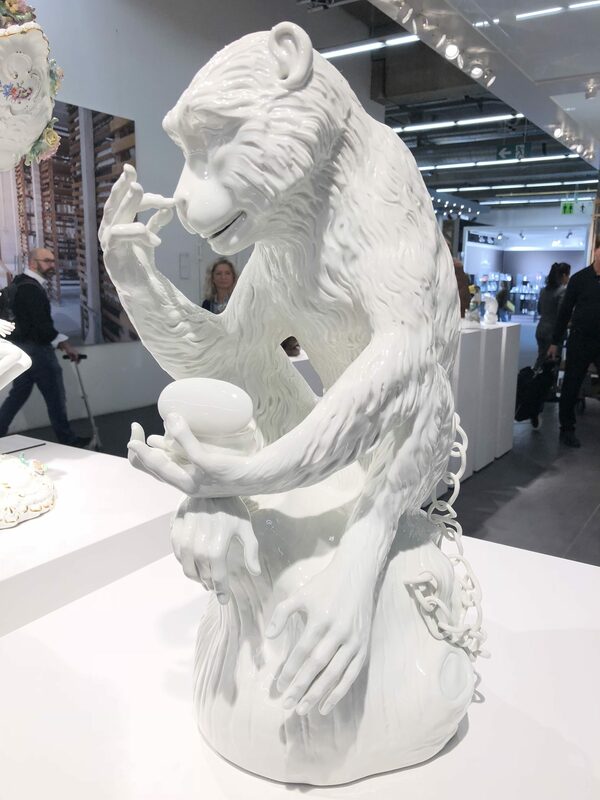 The newest and most innovative consumer goods are introduced each year at Ambiente, the world’s largest international trade fair for consumer goods, which takes place each year in Frankfurt am Main Germany. In mid-February, the five-day-long fair attracted 4,441 exhibitors from 89 countries, including Germany, Italy, China, France, the United States, the United Kingdom, the Netherlands, Spain, Korea, among many others. Exhibitors displayed the latest products and designs in dining, cooking, household goods, interior décor, gift items, jewelry and home furnishings at the expansive exhibition space that is 3.3 million square feet (308,000 square meters) in size. 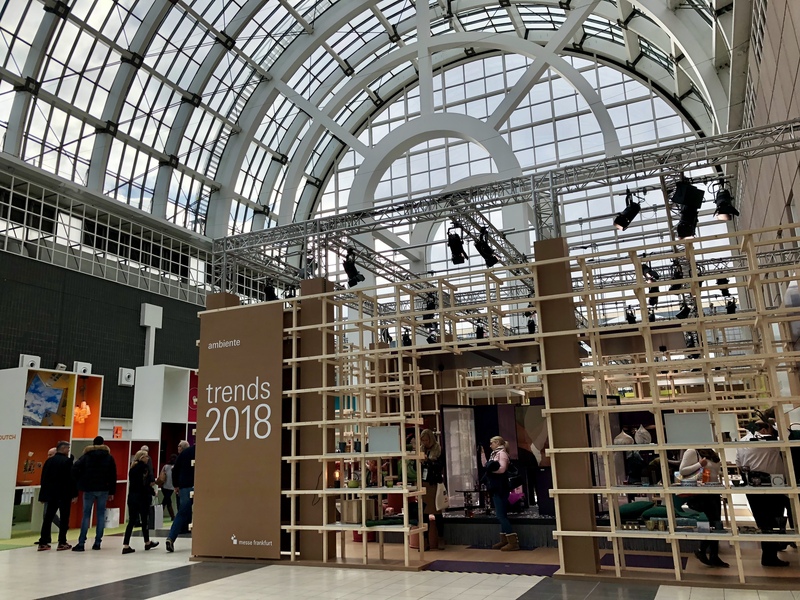 This year, 134,600 buyers from 168 countries traveled to Messe Frankfurt to scout out and order the latest innovations that they believe will be the big sellers in the future. 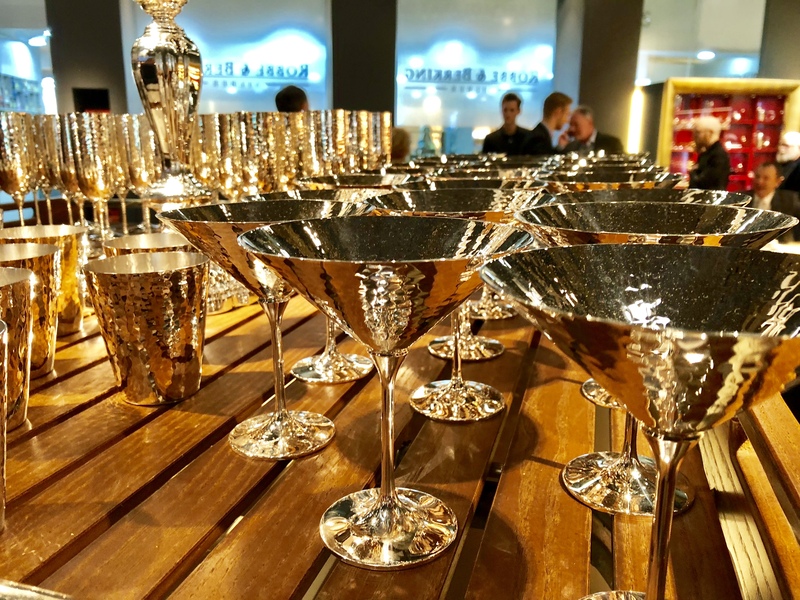 Indeed, it is here, at Ambiente, that the international consumer goods industry receives its direction for the entire year, says Erdmann Kilian, Messe Frankfurt’s Director of Marketing and Communications. It is estimated that revenues in excess of one hundred billion euros are generated by the products that are bought and sold here each year. “We have never had so many international exhibitors before,” Kilian says. 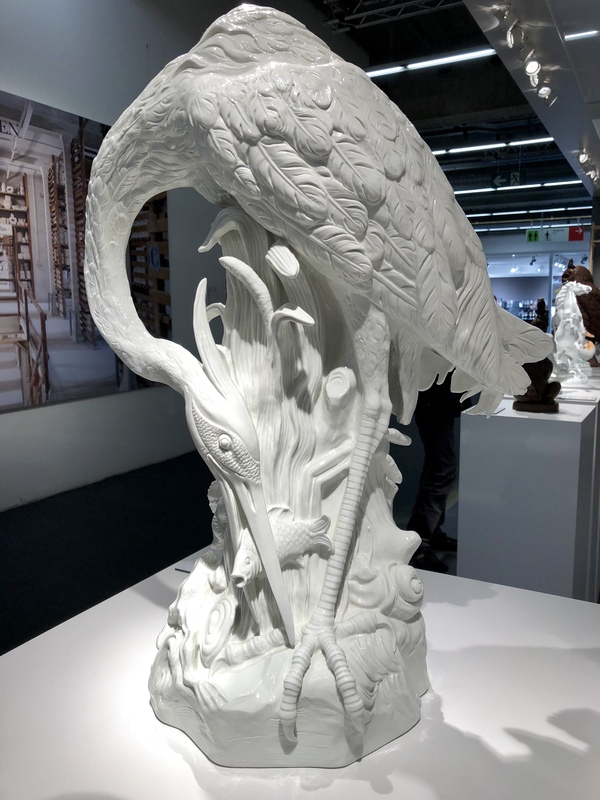 “Many of the companies that exhibit here have export rates of up to 80% and by being at Ambiente they reach a global audience.” Ambiente sets the pace for the global consumer goods industry, he adds. 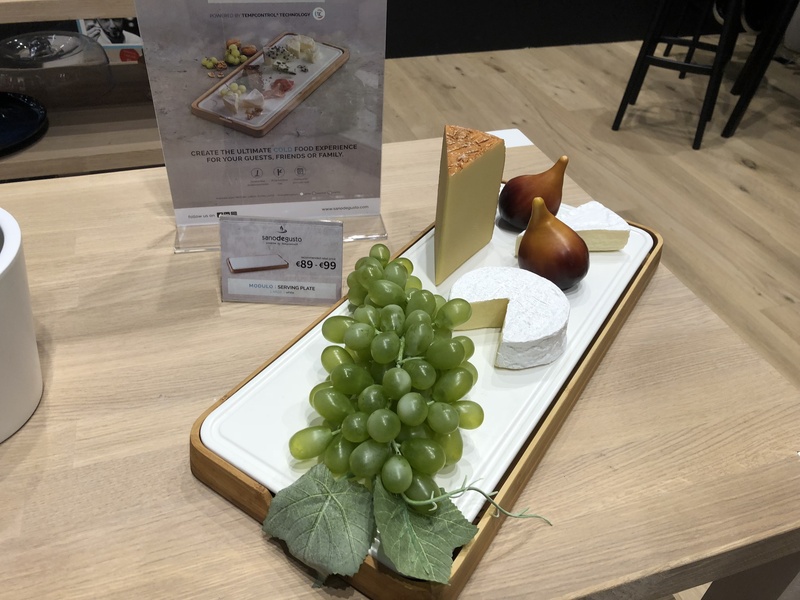 Pursuitist attended the five-day fair in search of the latest and greatest products consumers can expect to see in stores in the near future. From smart products to common products with a twist, and the return of iconic vintage designs, 2018 promises to be an exciting year for the consumer goods industry. Smart products were first launched at Ambiente several years ago, but the sleek stainless steel tea kettle made by Bugatti is like no other. 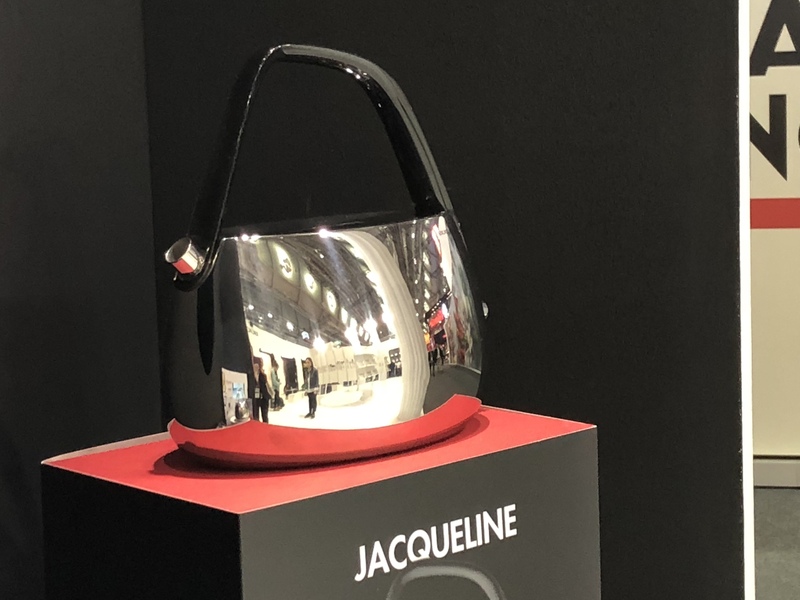 Called the Jacqueline, it is a smart kettle that combines technology with style as it can be remotely controlled through an App on a smart phone and programmed to turn on and off whenever desired as well as set it for a particular temperature. The app will even tell you when the water is ready. The retail price for the Jacqueline is 299 Euros (approximately $371). The kettle can be purchased through the Bugatti website. Everyday products will be customized and made-to-order. Several exhibitors, including Bugotti and Giobagnara are offering appliances, clad in leather. In addition to leather, Bugotti’s Jacqueline tea kettle can be custom-ordered in several different types of leather or Swarovski crystals. Each piece is unique because it is hand-made by artisans in Italy. 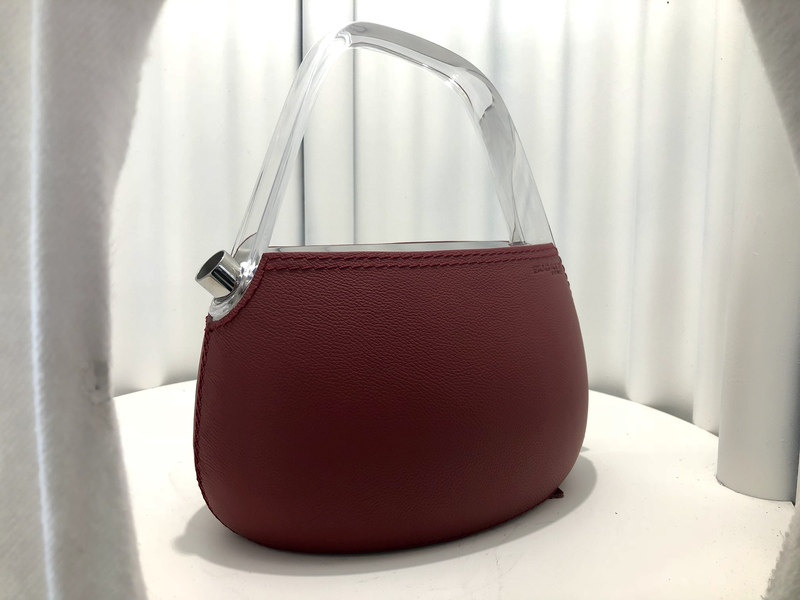 Depending on the finish selected, a custom-made leather-covered Bugotti Jacqueline tea kettle will retail for 890 euros (approximately $1,104). 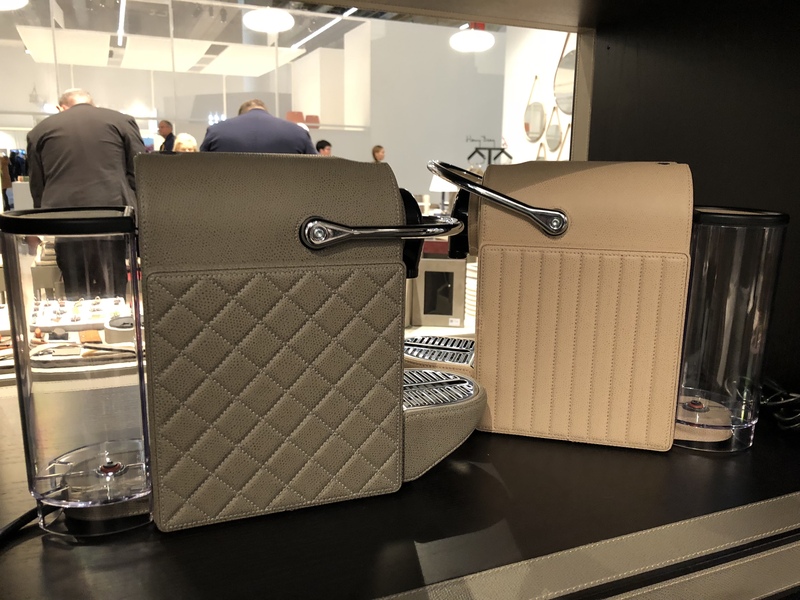 A Nespresso coffee maker stylishly enhanced by Giobagnara of Italy in leather was also launched at Ambiente. 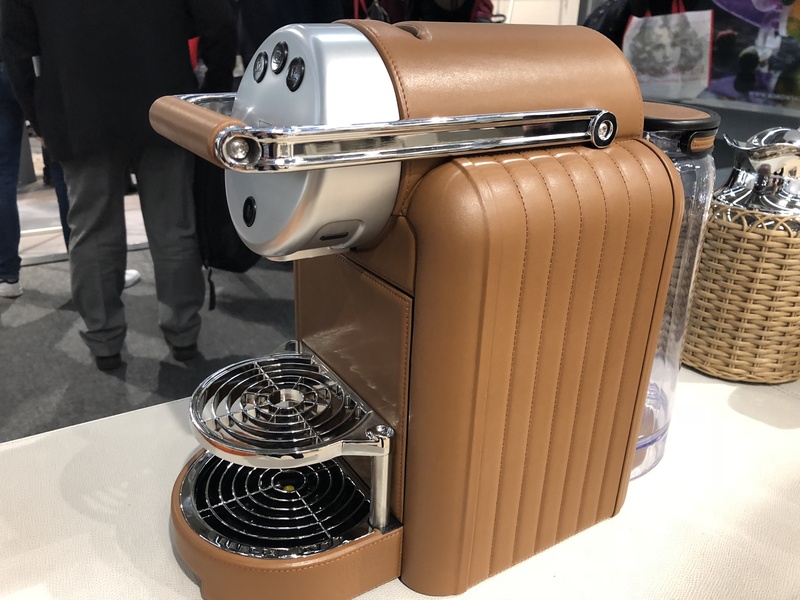 The coffee maker can be custom-ordered in a variety of colors and patterns of leather on Giobagnara’s website or from TableArt in Los Angeles. 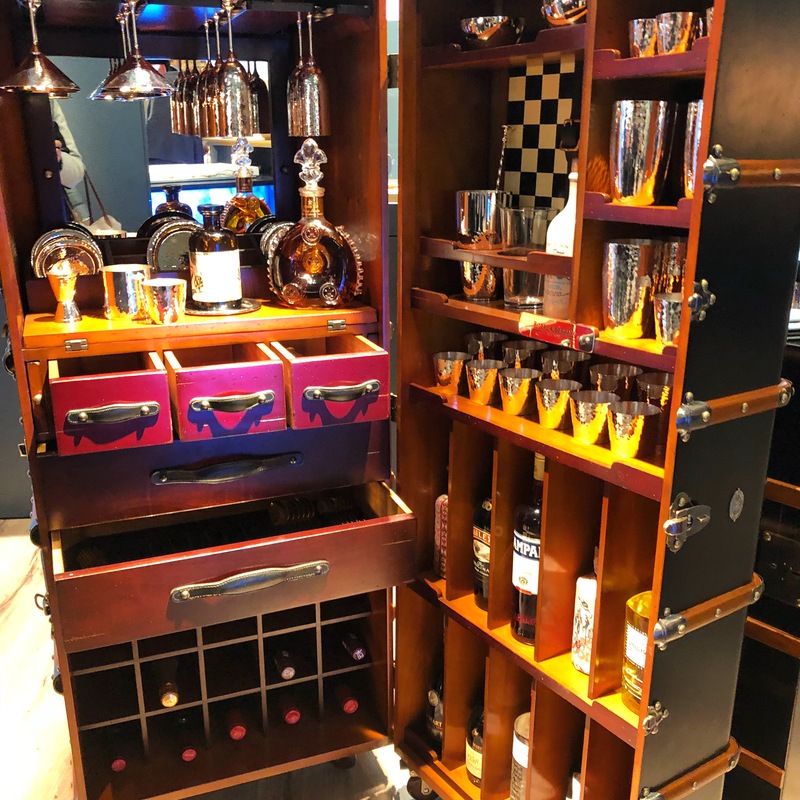 The retail price for the leather coffee maker is 2,000 Euros (approximately $2,481) for the small unit and 3,000 Euros for the larger model (approximately $3,722). 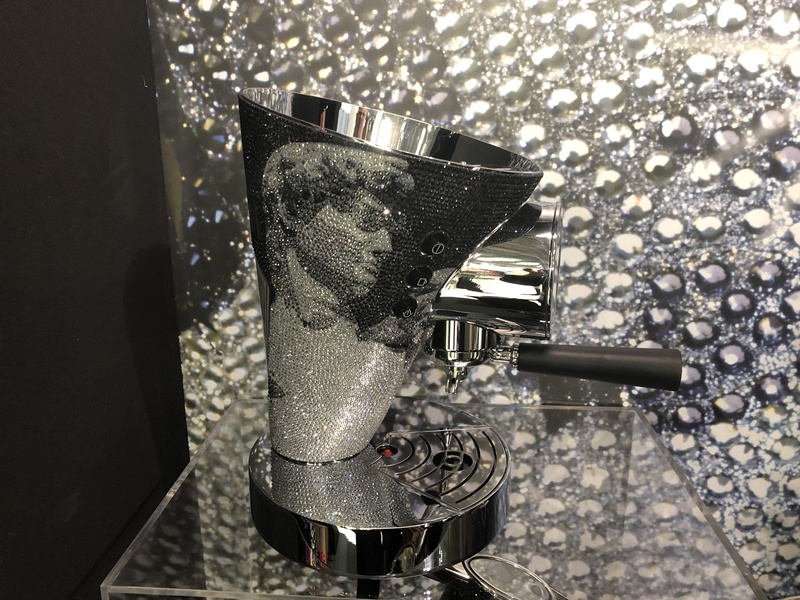 An espresso maker decorated with Swavorsky crystals can be custom-ordered from Bugatti. 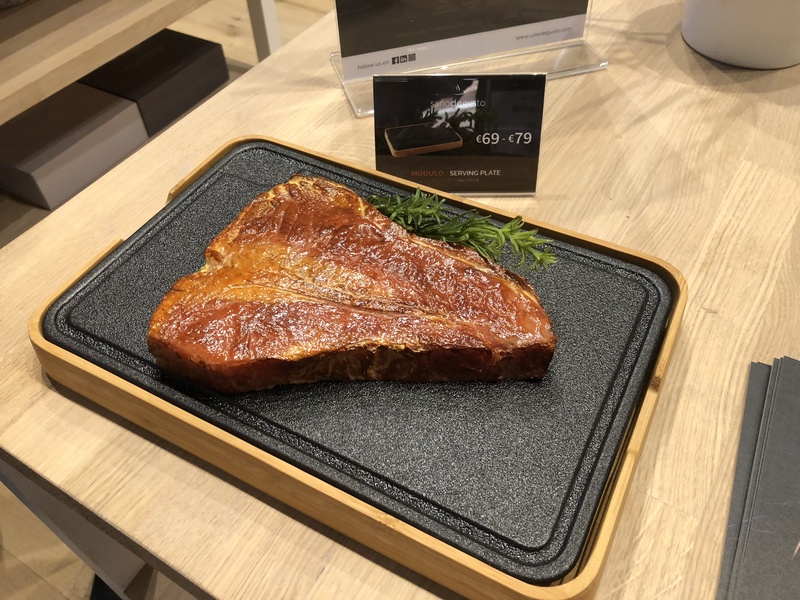 Several companies launched serving pieces and dishes that retain either heat or cold temperatures in order for food to be kept warm or cold. Sanodegusto, for example, offers integrated technology that keeps ceramic plates warm for more than 30 minutes. The plates must be pre-heated in a warmer or oven. Likewise, after Sanodegusto’s plate for cool temperatures is placed in a freezer for 70 minutes, it will keep food cool for up to 30 minutes, perfect for shellfish, cheeses and fruit. 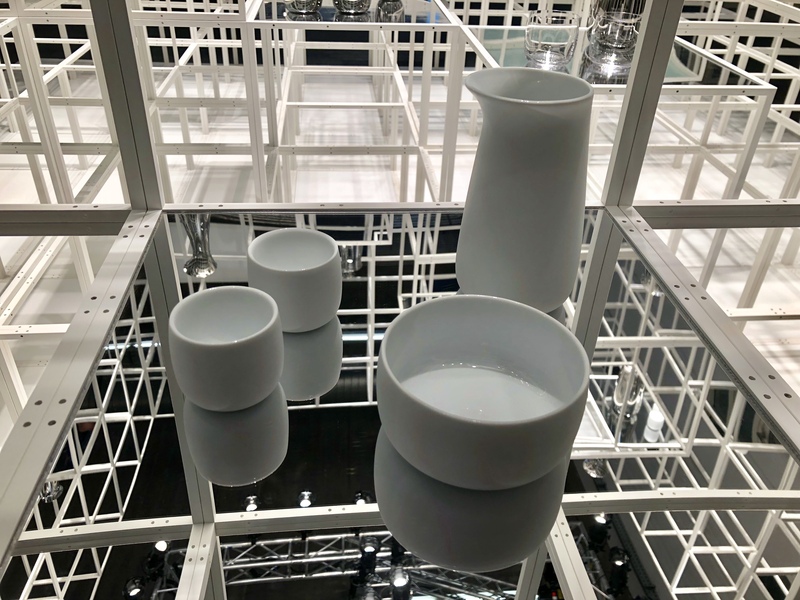 Famed British architect, Lord Norman Foster, designed a line of porcelain and stainless steel tableware for Stelton of Denmark. For the Scandinavian design company, Foster designed a new line of tableware, in which he merged simple sculptural form and soft geometry. 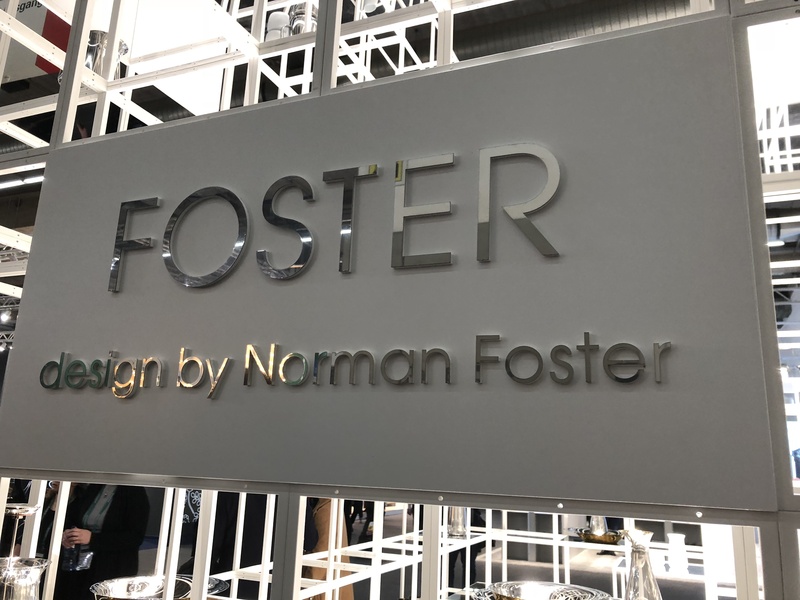 The Foster collection includes wine goblets, wine carafes, bowls, coffee and espresso cups, sugar bowls, a thermos and water carafe, in either stainless steel or porcelain. 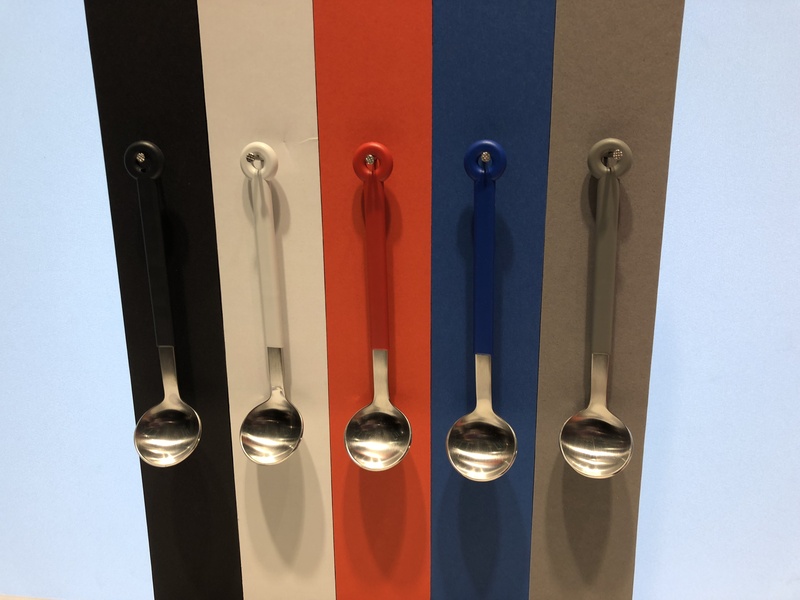 At Ambiente, Mono launched an updated version of its famous Mono Ring stainless steel and plastic coated flatware originally designed by Peter Raacke in 1962. 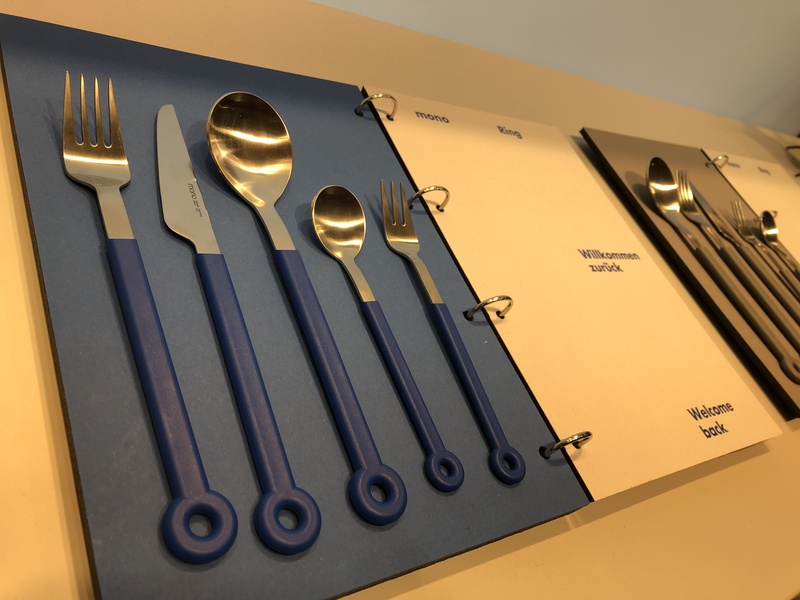 The iconic flatware, that is part of the permanent collection at the Museum of Modern Art in New York, was discontinued in the mid-1990s but was updated and modernized. Raacke’s idea was that flatware does not need to be stored in a drawer; rather it can hang visibly on a cross-shaped rack in the center of the table. The idea of “self-service” at a dining table was considered revolutionary at the time. The young designer, Mark Braun, 47 years younger than Raacke, is responsible for reinterpreting it for its reintroduction. The 24-piece set with stand will will be available in five colors and will retail for 525 Euros (approximately $650). 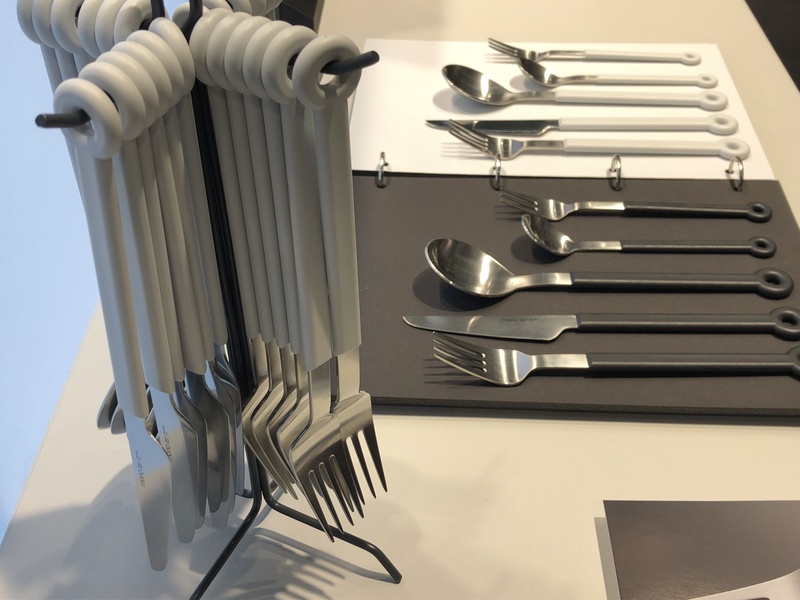 Mono is launching an updated version of its famous “ring” stainless steel and plastic coated flatware originally designed by Peter Raacke in 1966. 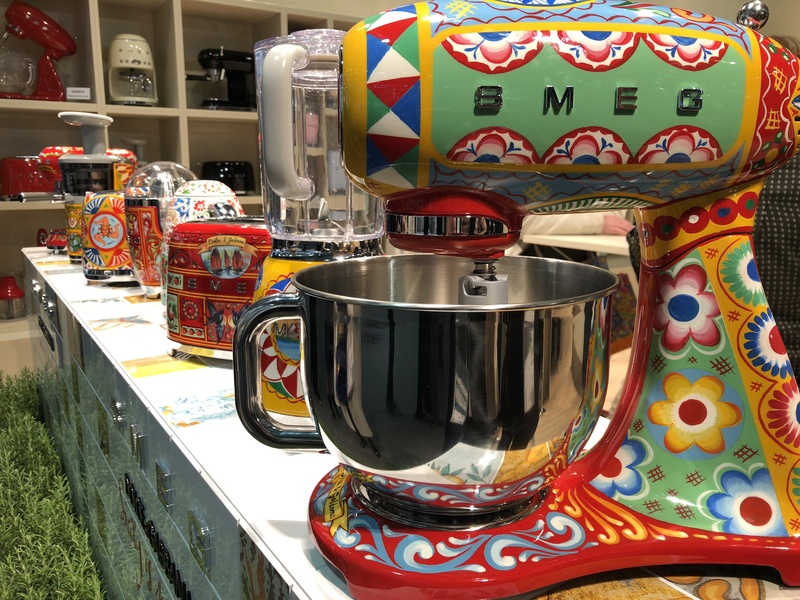 At Ambiente, Smeg, famous for its iconic retro-looking refrigerators launched a line of appliances featuring designs by fashion house Dolce & Gabbana. 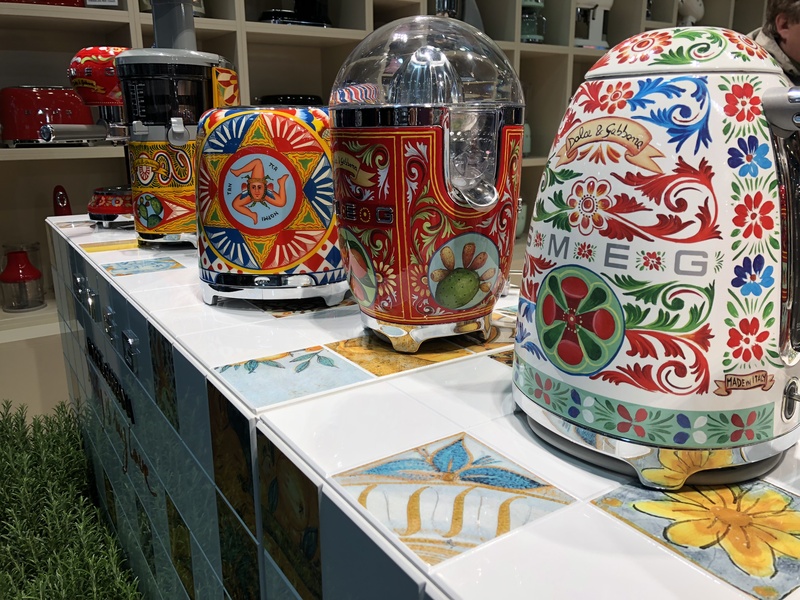 Called “Sicily is My Love”, the line of small appliances include a toaster, citrus juicer, coffee machine, kettle, blender, stand mixers and slow juicers, decorated with symbols of Sicily, including gold lemons, citrus fruits, prickly pears and bright red cherries. 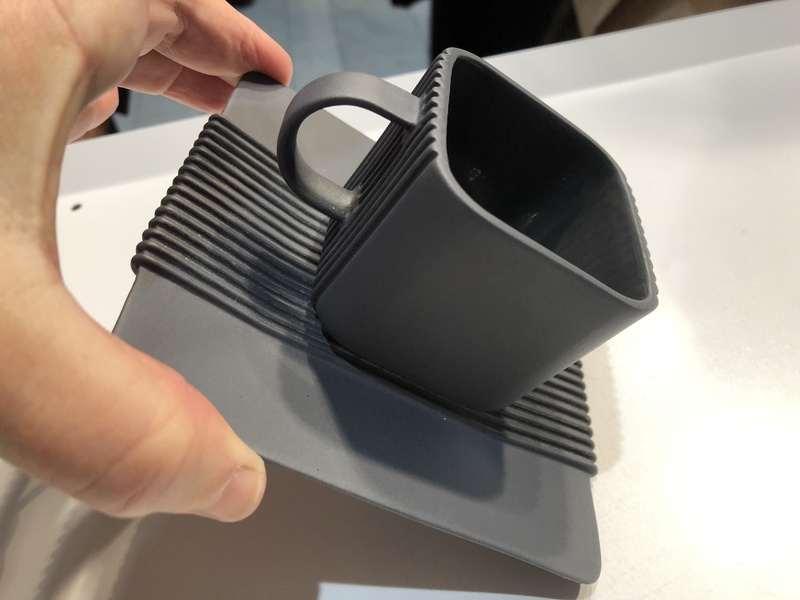 Cmielow Design Studio of Poland designed an innovative espresso cup and saucer in which ridges at the bottom of the cup mate perfectly with the ridges on the matching porcelain plate, providing a secure grip in a variety of positions that prevents slipping. 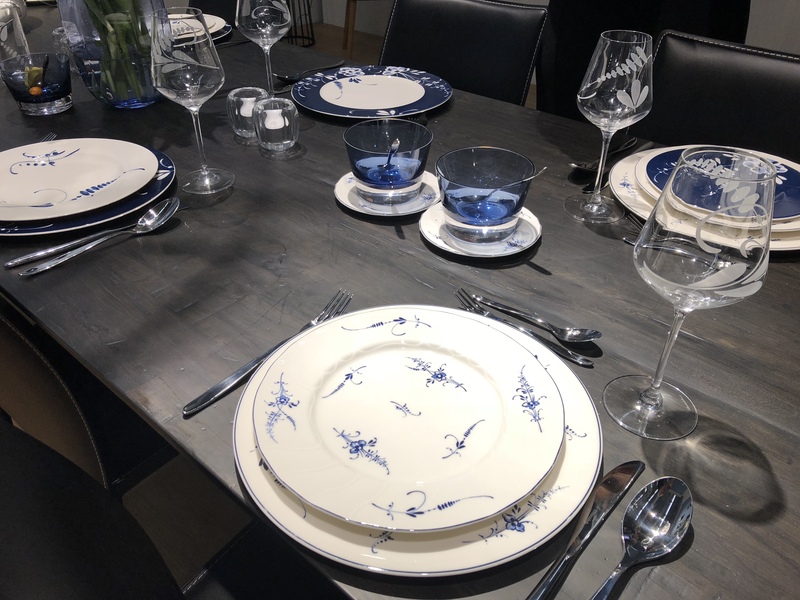 Porcelain manufacturer Meissen may be one of the world’s oldest manufacturers of fine china in the world, but it is launching contemporary designs in addition to offering iconic pieces it has been famous for producing for nearly 300 years. 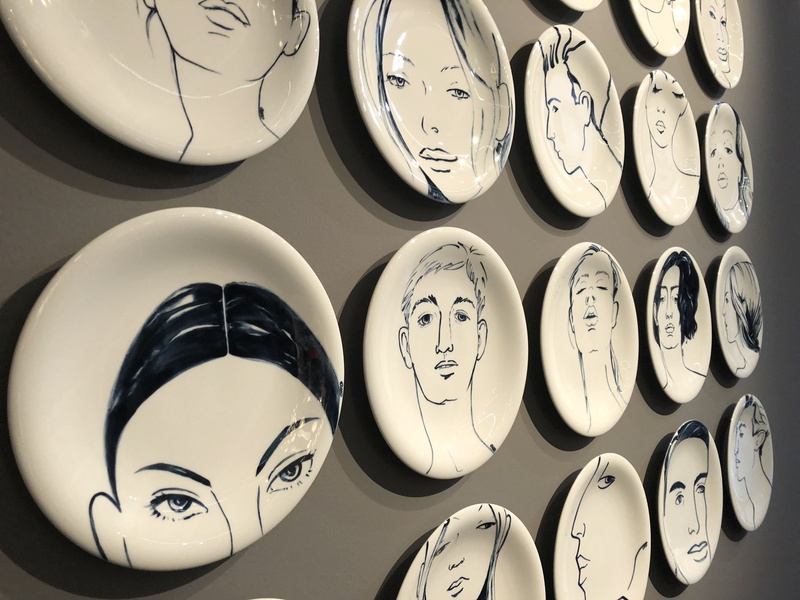 “Faces” is a new collection by Meissen that includes a series of plates (seen below) while it is still handcrafting the iconic animal figures have been so popular for more than 300 years. Meissen’s monkey with a snuffbox (see photo below) was originally ordered for the palace of August the Strong in 1732. Villeroy & Boch relaunched “White Rose” which was originally introduced in the 1960s. There are four different designs, including a relief in white. The manufacturing process was modernized and the color of the porcelain is whiter than when released fifty years ago. “White Rose” will be available in the U.S. this summer. 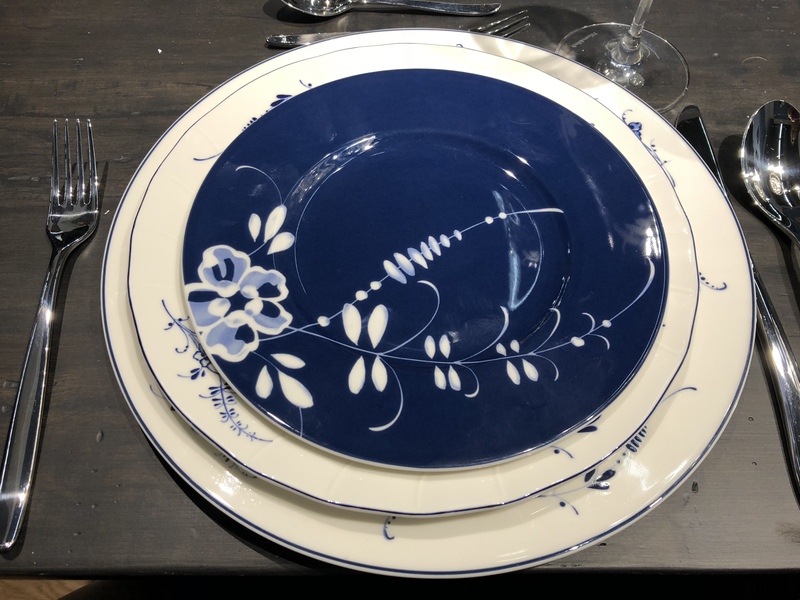 The company also showed an old classic, “Old Luxembourg”, that dates back to 1768, and paired with a complimentary plate with a contemporary design in blue. The name Robbe & Berking is known by connoisseurs throughout the world for its handcrafted sterling silver. 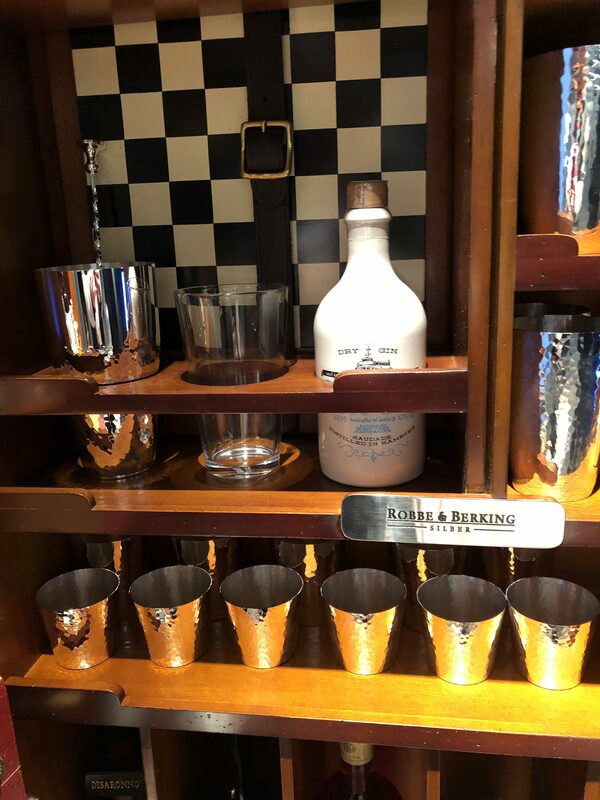 Now run by fifth generation family member, Oliver Berking, the company showcased a wooden cocktail trunk in two sizes, each stocked with its handcrafted barware collection which includes bar tools, cocktail shaker, beer tumbler, whisky tumbler, wine tumbler, cocktail coupe, and champagne flute, all in sterling silver. Robbe & Berking also launched a sleek set of extra sharp steak tools made of carbon with an anthracite-black coating. 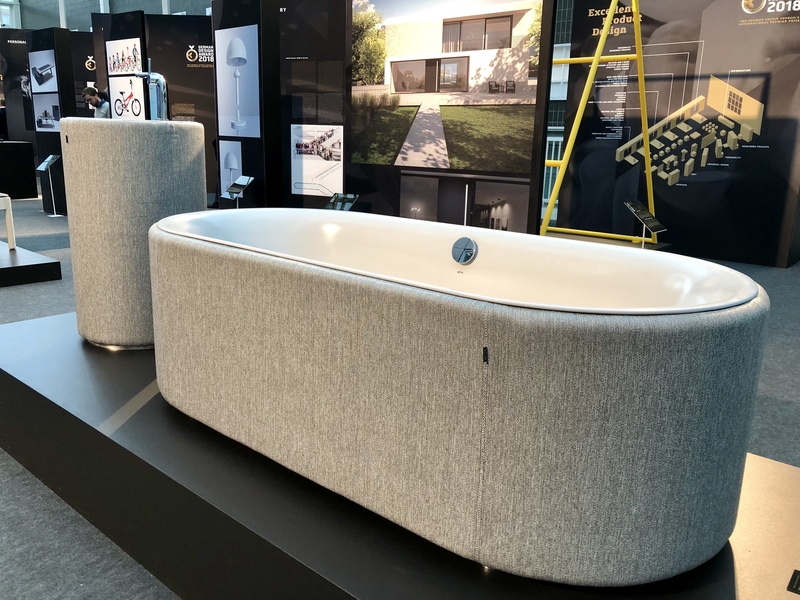 Winner of a German Design Award Tesseroux + Partner design studio enveloped the exteriors of a steel bathtub and the body of a matching wash basin with textiles for an elegant look. Remarkably, water can not not be absorbed and simply runs off, as the hydrophobic textile repels water. Additionally, since it is clad in fabric, the bathtub improves the bathroom acoustics.